Aloha! Today was a our last full day in paradise, and there were no scheduled activities for the day. We actually slept in a bit this morning, and enjoyed some breakfast pastries in our room. I drew Grace's initials in the sand after we did some swimming today. Then, we decided to give Grace her first chance to go swimming in the ocean. Yesterday, we took her down to put her feet in, but we didn't really have time to go swimming. So, today was the day. We got all suited up and made our way down to the beach. Grace loved swimming in the ocean today! Grace and I got in the water, while Kyle ran to the gift shop to get some sunglasses. As soon as I put her in the water in her life vest, she started grinning. 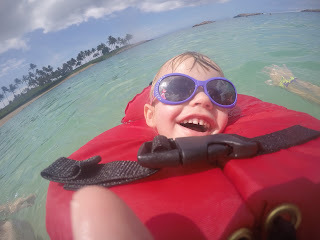 She really enjoyed floating on her back, and just giggled and giggled every time the waves rolled her. It was a little bright and sunny, but it was also overcast some of the time, so we all really enjoyed our time in the water. Kyle captured some really awesome photos on our GoPro camera, and we have been really glad to have it on the trip. While swimming in the ocean, we just marveled at the number of airplanes that flew in, guessing at least one every five minutes. We also just really enjoyed the time to be together in the water. Grace enjoyed it so much that she fell asleep. 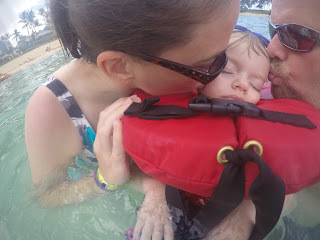 It took us a few minutes to decide if she was really asleep, but the water was so relaxing, she just drifted off. 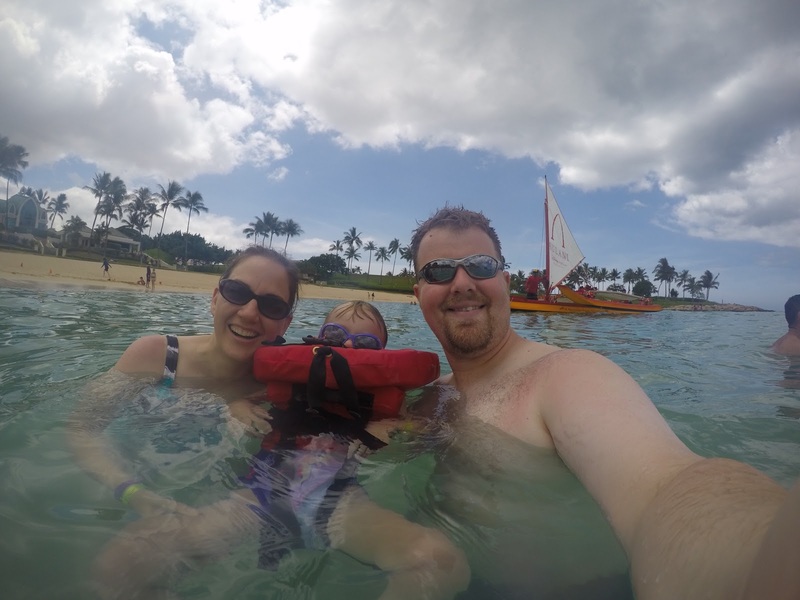 Family photo op with the Aulani boat in the background. After about an hour or so in the water, we decided to get out and play in the sand a bit. 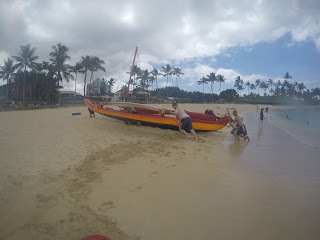 Kyle was called upon to help push a big boat onto the shore, while Grace and I played in the sand. 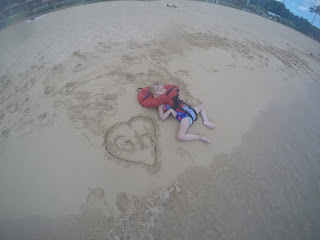 I drew a heart with her initials on it, and wrote her name in the sand too. Then, we buried her feet in the sand, and she seemed to really like it. This is Kyle helping to push the boat ashore. We decided we were sufficiently sandy, so we headed upstairs to clean up a little. I'm still pretty sure we will find sand in places when we get home, but we got dressed anyways, and headed back down to get some lunch at Mama's Snack Shop, and we ate outside just enjoying the scenery. We didn't even mind a few raindrops that fell, and saw a bride and a groom walk through the resort on the way to their wedding. It was awesome! I think we've seen Mickey Mouse every day we have been here! After lunch, we decided to take on of the Menehune adventure trails, which is sort of like a treasure hunt for kids with various stops around the resort. When we stopped by the Pau Hana room to get started, we just happened to find Mickey Mouse greeting visitors. 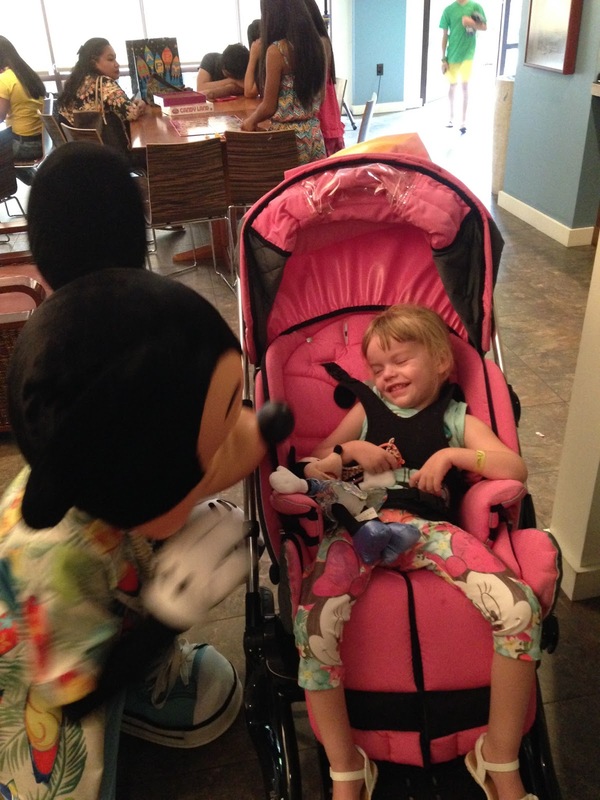 He made a special trip over to see Grace, remembering she was on a Make-A-Wish trip. Mickey played peek-a-boo with her, and made a game of catching the kisses she blew at him. Grace was just delighted. As we were leaving, we even saw another character, Stitch, on his way to greet visitors. 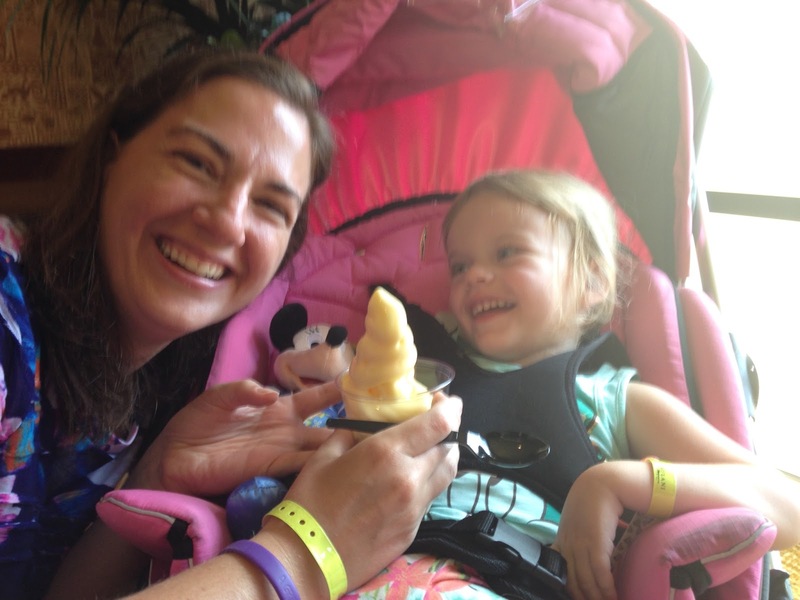 Mommy and Grace love ice cream! The Menehune adventure trail had a variety of stops, and each one had a map to lead you to the stop. Some of them activated water squirters along the lazy river, which was fun to see. It was sort of hot outside this afternoon, so we didn't' get to finish the whole trail, but got a Dole Whip ice cream treat instead. We ate it in the hotel, just settling in to watch the view and enjoy our sweet treat. It was another successful day for a nap, and Kyle and I rested too while Grace was sleeping. I even managed to write some of our postcards, and am hoping to mail them tomorrow. She woke up in about her usual hour and a half, and then it was time to get ready for our special meal at Ama Ama, one of the nicest restaurants at the resort. Kyle has been looking forward to it all week, and it definitely did not disappoint. The outdoor restaurant features a variety of seafood specialities and we were seated just before sunset on the beach. It was absolutely gorgeous. I'm not much on seafood, but Kyle got a beach boil with prawns, oysters, clams and other goodies. I had a steak, and Grace had pasta. We even treated ourselves to some dessert. Kyle and I split some chocolate cake, and Grace had strawberry sorbet. As we were finishing up our dessert, one of the restaurant's managers came over to our table with our waitress to see how our dinner had been. They also brought a very special gift for Grace. It was an Aulani apron that had Grace's name on it, and signed by the entire staff. Kyle and I were both so overcome with emotion for the special gift. And somehow Grace knew it was for her and special too, because she just kept grinning the whole time. She especially liked the picture of Minnie Mouse they drew on it. 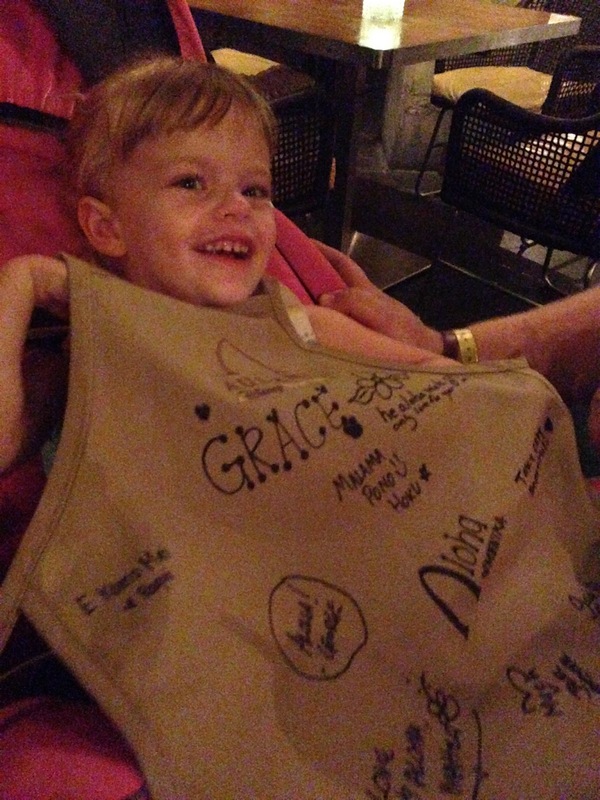 Grace just loved her apron from the Ama Ama staff (and her mommy and daddy did too)! Every single staff member at Aulani has been a very special part of our trip. They have gone out of their way to make sure we are having a good time and looking after us. The apron is such a special keepsake that we will always treasure from our trip. We are down to our very last day in paradise before we head home to reality. The resort offered us a late check out, so we can stay here until the taxi picks us up before our flight. Stay tuned for our last day of magical adventure!